A group exhibition by young artists who graduated from non-mainstream art schools in Thailand, Under the Radar showcases the artists’ diverse and sincere experiences and the aesthetics of another art league in the country.If we are to ask what contemporary art is today, there should be several possible expressions, doctrines, flavors and identities that challenge the central formula monopolizing the art scene. Numerous scholars and critics have given a similar conceptual framework suggesting that contemporary art resembles a jigsaw puzzle that requires the many pieces from around the world to create or explain a complete and accurate or realistic picture. Meanwhile, centralism has been stamped out and regional, national, provincial and subcultural contexts have emerged vigorously and extensively in the global art community. 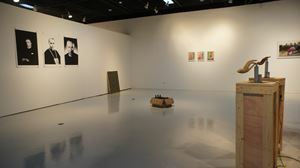 Under the Radar features works by six artists, namely Anuphap Phetlaisee, Anurak Khotchomphu, Kanyarat Buranapakdee, Kiattipong Longye, Pongsakul Chalao and Sudarut Vongnangam. It aims to introduce unrecognized aesthetics of the participants whose artistic skills, educational backgrounds and attitudes are molded into art products in order to communicate with the audience a new artistic paradigm. In addition, this exhibition explores a new possibility for Thai contemporary art to flee from the reproduction of the institutionalized mainstream art.